Jack Bowen knows it doesn’t really matter how the points come for AFC Rushden & Diamonds as they bid for a play-off place in the Evo-Stik League South Premier Division Central. 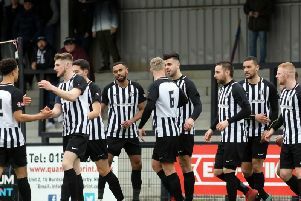 The striker’s 12th goal of the season in all competitions proved to be the winner at Hayden Road last weekend as his looping header four minutes before half-time sealed a 2-1 success over Needham Market. The victory ended a run of three games without a win for Andy Peaks’ team and it was far from a classic as the game was played out in the face of a gale-force wind that swept across the ground. But Diamonds toughed it out to get back to winning ways and they now head to Barwell this weekend sitting in the final play-off position. And frontman Bowen felt last weekend’s win showed the character of the squad as they look to launch one final push for a top-five finish in the last seven matches of the season. “We are worried about ourselves and making sure we tick off the three points,” he said. “If we keep doing that then we will find ourselves in the play-offs. “It’s getting to the crucial stage of the season where you have to pick up points. “Whether it’s as ugly as last weekend or playing teams off the park and winning 5-0, they all count for three points so we were pleased. “I think those conditions against Needham are the worst we have played in this season, the wind really changes the game. “We knew it would be a game of two halves and that we would have to deal with the conditions and we got ourselves in front with the wind in the first half and managed to hold on in the second. “Results hadn’t gone for us before the game but we have a good group of lads and we just said we would get behind each other and get the result. 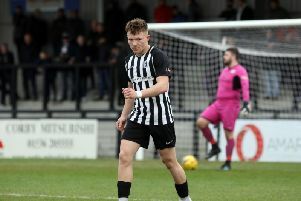 Having started the season in good form in front of goal, Bowen’s season was hit by injury and he has had to wait for his opportunity to get back into the starting line-up due to the form of top scorer Tom Lorraine. But Bowen started in the 2-0 defeat at Rushall Olympic and then headed home the winner after keeping his place against Needham Market. “I have had to wait on the sidelines for quite some time after the injury,” he added. “There was nothing I could do about that, Tom was scoring for fun and I was completely behind him. “But it’s nice to have had the opportunity with the game last Monday and then Saturday. I feel like I have taken my chance and it’s obviously always nice to get the winner."